Use our suggestions to create interesting sensory bins, circle time discussions, role play scenarios, and crafts with your young veterinarians! During circle time, place a variety of accessories related to the theme on a table in front of your group. Place hair or fur from different animals inside transparent containers. Let children observe them and identify the differences and resemblances. Let them touch them too. Cut out several animal tracks. (Open pet tracks) Glue identical tracks on the floor to create paths and glue the corresponding animals at the end of each path. Encourage children to follow identical tracks to discover the animal they belong to. Cut pictures out of magazines and display them on the wall throughout your daycare. The pictures can be used as a memory game or to spark a conversation with your group. Use them to decorate your daycare or a specific thematic corner. (Open picture game-Veterinarians) Print, laminate, and store in a Ziploc bag or in your thematic bins. 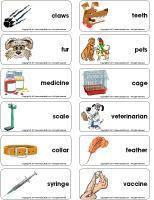 (Open writing activity-V like veterinarian) Print for each child or laminate for use with a dry-erase marker. 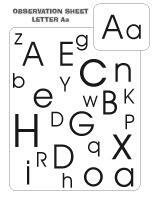 (Open observation sheets-Letter A) Print for each child or laminate for use with a dry-erase marker. Dog biscuits and/or bones can be used instead of blocks. Giant bricks can be used to build a doghouse. Deposit a bin filled with reptiles and snakes in your area, they can also represent pets! Coloring pages representing various types of pets. Dry dog or cat food can be used to make collages. Bird seed can be used for collages too. Empty toilet paper rolls can be used to create miniature dogs...you can provide models or simply let children use their imagination. Feathers can be used for painting. Children will enjoy pretending they are painting with bird wings. Stuffed animals representing various pets. A doctor's kit and/or a veterinarian's kit. Pictures of different animals can be displayed on the walls. A white smock (or a white shirt) and gloves. Empty pill bottles for medicine. Memory game involving pictures of pets from the educatall club. 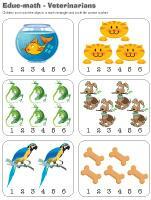 Association game in which children must associate a baby animal to its mother to help children learn animal names. Fur and feathers for observation and manipulation. 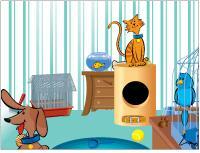 Animal sound association game involving pictures of animals. Photo albums filled with pictures of children and their pets...simply ask parents to provide pictures. A water table can be part of a pet salon. Offer stuffed animals which can be submerged in water, sponges, soap, towels, etc. Hide small mice or hamsters (stuffed animals) in wood chips. Children will have fun searching for them over and over again. A container filled with water, tiny aquarium pebbles, and plastic fish. A container filled with feathers. Children can use them to tickle one another. A small container filled with clumping litter and eyedroppers. Show children what happens when you drop water on the litter. 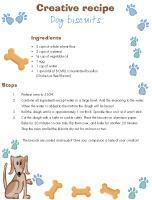 Bake dog biscuits with your group (see creative recipe in educatall club). Try a smell experiment and discuss how a dog's sense of smell is highly developed. 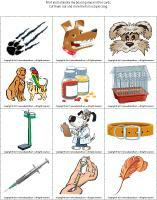 (Open picture clue story-Veterinarians) Print. Sit in a circle with your group. Begin reading the story and pause for each illustration. Point to the illustrations and encourage children to guess the missing words. 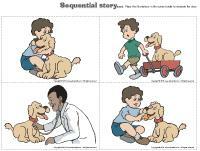 (Open sequential story-Veterinarians) Print, laminate, and cut out the illustrations. Children must place them in the correct order to recreate the story. During transition or relaxation periods, show babies pictures of animals. Name them over and over again until they are able to name them too. Show children a series of animal pictures. Make each animal sound and encourage babies to make the corresponding sounds. Cut pictures of animals which visit the veterinarian's office out of magazines. Glue them on colourful cardboard and laminate. Babies will admire the pictures. Print a dog outline for each baby. Let them paint their dog with several different colors of finger paint. You may also offer other substances such as Jell-O, pudding, etc. Invite children to move about the daycare like certain animals. You may ask each child to move like a different animal and have the other children guess which animal it is. If you prefer, you may name one animal and ask your entire group to act like it simultaneously. Determine a starting line. Give each child a ball of yarn and ask them to roll it on the floor as far as possible while holding the end in one hand. Use adhesive tape to mark each child's distance. Who will roll his/her ball the farthest? Purchase several dog bones and deposit three pails (different sizes) in front of the children. They must try to toss the bones into the pails. Write a certain number of points on each pail. Calculate each child's total. Provide several stuffed animals and toilet paper rolls. Show children how they can wrap the toilet paper around the head, arms, or legs of the animals to represent casts. Children will also enjoy playing with the items found in your doctor's kit for this activity. Encourage children to invent an original pet. They can use modeling dough or salt dough. They can paint or decorate their pet as they wish. Invite children to present their pet to the group during circle time. Help them find a name for their pet and tell you where it lives, what it eats, etc. (Open model-mouse) Print, cut out, and hide the mice throughout the daycare. Children search for the mice. Give each child a ball of yarn. Tie the ends in different corners of the daycare (chairs, furniture, etc.) Children become kittens. They push the balls in every direction. One child plays the role of the kitten keeper and all the other children are kittens. The kitten keeper must try to catch all the kittens. When he catches a "kitten", he must tickle the child. The game continues and the captured kitten becomes a kitten keeper too. Each child digs a hole in the sand or in the snow to hide an object. Then, children search for the items. Plan an outing to visit a local veterinarian's office. Invite parents to join you. Organize an outing to your local pet shop. Invite parents to join you. 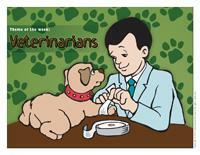 (Open magnifying glass game-Veterinarians) Print and laminate the cards and board game. Cut them out and store them in a Ziploc bag or a box. Children pick a card and search for the item on the board game using a magnifying glass. When they find the item, they deposit the card in the correct square on the board game. 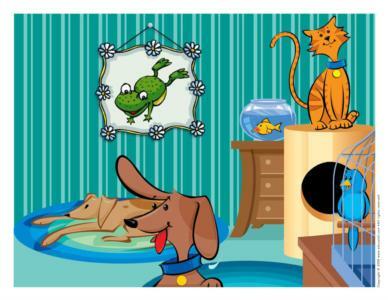 (Open association game-Pets) Print and laminate the two series of pet illustrations. Give children the illustrations. The object of the game is to associate the missing parts with the correct pets. 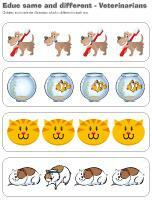 (Open sequential story-Pets) Print the story, laminate, and cut out. Children place the illustrations in the correct order to recreate the story. (Open hunt and seek-Pets) Print and laminate. Children pick a card and search for the item in the scene. (Open dominoes-Pets) Print, glue on heavy cardboard, and laminate. This game is for 2 to 4 players. Each child picks five cards. Deposit the other cards in a stack on the table. Place one card. The first player then tries to place a card with an identical object next to it. Identical pets must be touching. The next player then tries to do the same and so on. If a player does not have a card he can play, he must pick an additional card from the stack. If he still cannot play, his turn is over. The game ends when a player has no cards left. (Open hunt and seek-Veterinarians) Print and laminate. Children pick a card and search for the item in the scene. (Open educ-same and different-Veterinarians) Print and laminate for durable, eco-friendly use. Children must circle the illustration which is different in each row. 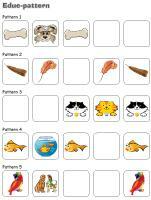 (Open educ-pattern-Veterinarians) Print and laminate. Children must complete each pattern by placing the correct illustrations in the squares using Velcro or adhesive putty. 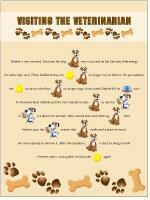 (Open educ-math-Veterinarians) Print and laminate for durable, eco-friendly use. Children must count the objects and circle the correct number. (Open educ-association-Veterinarians) Print the game. Glue the first two pages inside a file folder. Cover with Mac-Tac. Laminate the illustrations and cut them out. Stick a piece of Velcro behind each illustration and on each illustration on the board game (you may also use adhesive putty). Children associate the illustrations. When they have found the correct association, they simply stick the card in the correct place. Ask children to bring their favourite stuffed animals from home and set up your own veterinary hospital. Provide your doctor's kit, bandages, latex gloves, blankets, etc. Let children have fun taking care of their animals throughout the day. Variation: Teddy bear hospital. Deposit all the teddy bears you have in a pile and include them in your activities. Use cushions to create tiny beds and offer bandages, a doctor's kit, toy syringes, and anything and everything you have which can be used by your little veterinarians. (Open poster-Teddy bear hospital) Print and display. Each child selects a partner. One child is the master and the other child is the pet (let children decide what kind of animal they are). The master must care for his pet throughout the day. He must feed him, take him for walks, play with him, etc. The following day, the masters become the pets. Invite children to bring a picture of their pet to the daycare (or a picture of the pet they wish they had). They can take turns presenting their pet to the group. Display the pictures on a special wall. Give each child a piece of white paper which you have folded to create three sections. 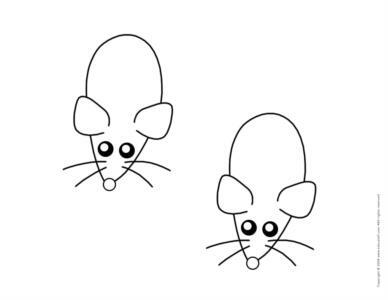 Ask children to draw an animal head in the top section and then fold the section down before passing the paper to the child sitting next to them. Children then draw an animal body in the middle section before passing the paper along once more. Finally, children draw animal legs in the third section. When everyone is done, unfold the papers to discover silly animals. They will be very unique. Deposit a variety of soft objects and rough objects in a box. Encourage children to manipulate them. Help them identify the objects which are soft like a kitten. Try different experiments which can be done in the dark with your group. Have children verbalize what they can and what they cannot see. Fill a few drinking glasses with water and add food colouring. Using an eyedropper or syringe, let children try different colour combinations. 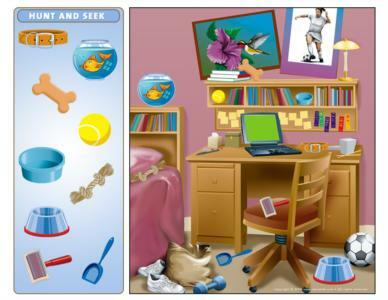 Collect pet hair and feathers (beware of allergies) and purchase magnifying glasses. Let children examine the pet hair and feathers with the magnifying glasses and discuss any resemblances, differences, etc. Dogs have a very strong sense of smell. Pour a small quantity of various essences onto cotton balls and drop them in empty medicine bottles (lemon, maple, vanilla, etc.) Gather your group and blindfold children one at a time. Have each child smell the bottles and try to identify the scents. Combine all ingredients except water in a large bowl. Add the seasoning to the water. When the water is added to the mixture the dough will be heavy! Roll the dough until it is approximately 1 cm thick. Sprinkle flour on it so it won't stick. Cut the dough with a knife or cookie cutter. Place the biscuits on aluminum paper. Bake for 20 minutes on one side, flip them over, and bake for another 20 minutes. Stop the oven and let the biscuits dry out for an hour or two. The biscuits are cooled and ready? Give your companion a taste of your creation! (Open pet shapes) Print for each child. Deposit pieces of yarn, fake fur, different types of paper, felt, etc. in the centre of the table. Encourage children to pick a pet shape and use the material to fill it completely. Encourage children to build a doghouse using Popsicle sticks. Ideally, use white glue for added solidity. Once their doghouse is completed, cut out a dog illustration and glue it inside. Have children place their hand in paint and then make a print on a piece of paper. Once dry, let them create the pet of their choice by adding paint, pencil marks, or other materials. (Open craft-Dog puppet) Print and cut out the various dog parts for each child. Assemble the pieces by gluing them onto a brown paper lunch bag. Encourage children to find a name for their dog puppet and prepare a short puppet show. (Open medals-animals-pets) Print and cut out. Children color and decorate their medal. When they are done, add a piece of ribbon and help children tie it around one of their stuffed animals. (Open masks-Cat) Print and deposit the masks in the centre of the table. Give each child a paper plate in which you cut two holes for the eyes. Using scissors and glue, children add eyes, a nose, a mouth, and moustaches. When they are done, add string and tie it behind their head. (Open craft-cat) Print for each child. Have children color the pieces, cut them out, and glue them on an empty toilet paper roll. (Open craft-dog) Print for each child. Have children color the pieces, cut them out, and glue them on an empty toilet paper roll. Each child creates a mystery pet using the material offered: modeling dough, salt dough, feathers, buttons, pipe cleaners, glitter, cardboard pieces, tissue paper, etc. (Open creative coloring-Veterinarians) Print for each child. 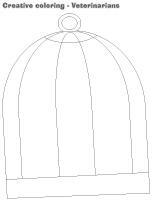 Invite children to draw their favourite pet in the cage. 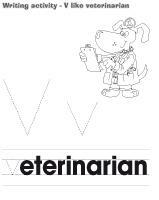 (Open coloring pages theme-Veterinarians) Print for each child.